Ok, the dark chocolate is kind of like an old school jello pudding pop.There's a wateriness to it as well. 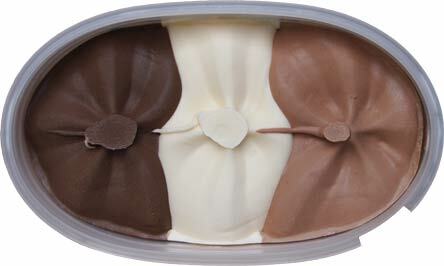 The white chocolate is creamy tasting and akin to other white chocolate ice creams. More specifically, it does make me think of the new magnum white chocolate tub which I thought was too strong in flavor & sweetness. Last is the "plain" chocolate which also tastes kind of watery. I guess it's good that it's not gummy, but it does seem like a possible formula change. If you mixed them all together, the white chocolate does take precedence in general. That's not necessarily a bad thing as it's the sweetest and most whipped creamiest of the bunch. Sorry, but that's my best description. The offspring of white chocolate and whipped cream (though more in terms of flavoring then texture). On Second Scoop: I tried having just some chocolate and white chocolate (so sans dark chocolate) and it reminds me of something.... like some kind of Hostess treat but I can't quite put my finger on it. --- ok, I have a helpful take away for you no matter how you mix and match the three chocolates. 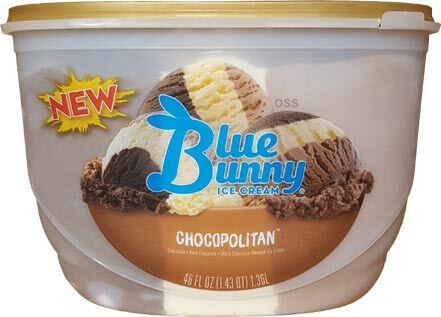 So this ice cream seems to lack the gums and stabilizers that are riddling it's competition, but it still feels... different. If you want to make it a bit more normal, just add some whipped cream. I know that's technically cheating by the usual OSS rules, but hey, it happens. My kids and I had this a week ago. We actually thought the dark component overshadowed the others. We were also lukewarm about this. There was not enough contrast, like in a neopolitan, to truly make anything stand out. I won't buy it again. We followed it up with a Market Pantry caramel brownie moose tracks. I had never had that combination before, and we enjoyed it more. Yeah, precedence might not have been the right word. I think the white chocolate is the most unique of the three, like you can always taste that sweet white chocolate note always trying to sneak in to your scoop. Have you had a chance to try Baskin Robbins flavor of the month? My company moved so instead of being 10-12 minutes away it's now 35-40 minutes away. Basically I'm done Baskin-Robbins review for awhile. Sorry. Ah im sorry to hear that. Must be a bummer. 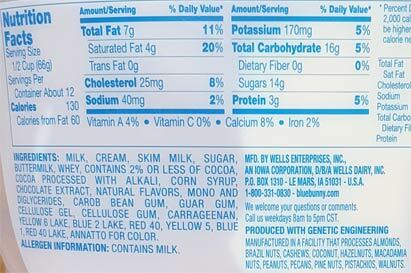 Just a note to Endless Universe--I've had BR's Boston Cream Pie April flavor. If you're wondering, it's awesome. @Endless: yeah, it's disappointing, but at the same time, it saves me from the frustration of going there and them only having the flavor of the month half the time. @May: Thank you. I was wondering if they did a good job with that flavor. Ill have to give it a try, especially with so few days left. @Dubba: Oh yeah that's right. I remember you mentioning your BR was usually late with flavors of months. The distance is a benefit in that case at least. And there are plenty of other brands with new flavors turning up recently. My daughter and I tried this last night and absolutely LOVED it! We both felt it was amazingly delicious! We agree that you can taste each individual flavor of chocolate. Will be buying more for sure! Wonderful! 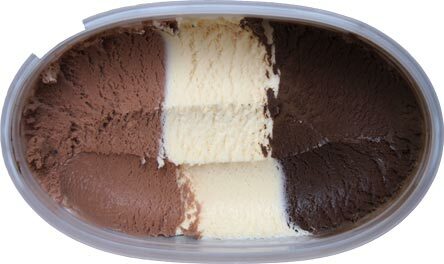 My husband thinks whoever thought of putting these 3 flavors of chocolate together should get a raise and a promotion. Needless to say he loves the Chocopolitan!